Traveling is an undoubtedly enlightening experience. Some travel to relax, while some travel to explore. Whatever be the purpose of roving onto various lands, one factor which influences travel plans majorly is the travel buddy accompanying you. Nowadays, many have also started venturing out alone, just enjoying the company of their pets! Whether you are a lone explorer, or love tagging your special someone along, or maybe you like travelling with your friends and family - kids and pets inclusive; you can see how each option changes the bigger picture in your mind. 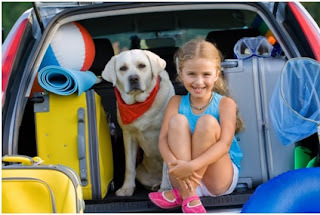 Before venturing out, make a list of basic stuff your children or pets require. Like favourite toys (ask your children to choose one in order to avoid over bagging with toys), juices, any other important articles - glasses, pumps etc. Include first aid units - band aids, antiseptic liquids, antiseptic gels and creams, pain reliever sprays and antibiotics for cold, fever and exhaustion. Make sure you carry enough drinking water. It is better to carry water with you then to commence search for it at dire hour of need. Children and pets often do not realize hunger or thirst amidst enjoyment. At such time, it is important that someone should always keep a tab on their hunger and thirst requirements. Keep healthy snacks with you in spare. Although, wherever possible, enjoy hearty meals but for those times between meals, be ready with treats - biscuits, wafers, rolls, homemade sandwiches, etc. Always keep checking activities of your children and pets. It doesnât take long for them to get distracted in a new place and head after their heartâs desires. In case of checking in hotels and resorts, make a query in advance with respect to bringing a pet along, since many of hotels and resorts do not allow animals. However, few hotels and resorts have special services for pets, which are subjected to change with respect to kind of pet one is bringing along. There are additional charges for certain facilities - make sure you get a clear picture of their services and rates. Ofcourse, no matter whom you are traveling with - safety is the one definite piece you need to tag along always. So kindly make sure, that you travel safe and as per the rules and guidelines of your transportation and destination. Always arrive well in time for trains or flights or buses to sort out your seat and baggage without much hassle and delay.